Renovated in 2005, the hotel features a beautifully well-tended garden. Guests are welcomed in the fully air-conditioned foyer with a reception desk open 24-hours. There is a hotel safe here, where valuable may be deposited for the duration of the stay. Dining options in the hotel include an elegant restaurant. The laundry service completes the offerings and those arriving by car may make use of the hotel car park. 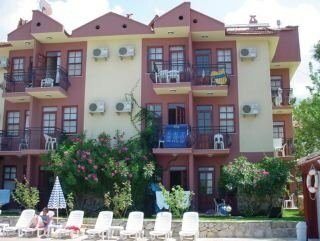 LocationThis appealing eco-hotel is situated about 2.5 km from Oludeniz, the pearl of the Mediterranean. Guests will reach Hisaronu, the leisure and shopping centre with countless bars and pubs, in about 500 m, while it is some 6 km to the wonderful beach and sea. RoomsThe rooms all come with an en suite bathroom. A hairdryer and a hire safe are provided as standard in all accommodation units. SportIn the well-tended grounds guests will find a swimming pool as well as a poolside snack bar, sun loungers and parasols. Sports enthusiasts may enjoy a round of tennis. MealsGuests may select their breakfast from an ample buffet. Lunch and dinner can be taken Ã la carte.